Reflective surfaces, when viewed commonly in every day life, are worlds within worlds and contain seemingly infinite possibilities as the viewer moves around them. In the relatively new medium of computer imaging, these effects are often produced in three dimension with mathematical precision, portraying subjects with a natural precision unparalleled by the human hand. However, Chex is NOT composed with such a program but done entirely by hand, using only two dimensional tools. Because of the subtle inaccuracies associated with imagery produced by hand, it may even be rather difficult to reproduce with more complex computer software. The birth of this composition was quite serendipitous without a pre-conceived design in mind. The composition began with random checkerboard patches rendered in different colors. After a single patch was created composing nearly one quarter of the background, it was then copied and a reversed copy (a copy of the same patch rendered in its opposite reflection) was joined to the original. This was then placed in position as one piece or patch now composing about half of the upper background. The new patch was again copied and the resulting copy was also reversed, inverted and then joined to the upper half, creating a large symmetrical square of patterns for the completed background. 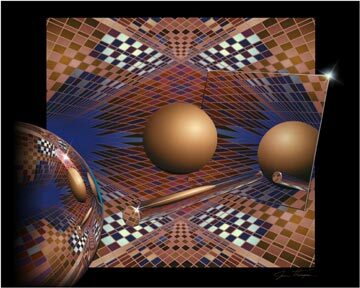 In the center of the background was placed a smooth sphere in warm tones of color that complement the background colors. A large patch was copied from the left center of the sphere and background, then rotated in a clockwise direction about five degrees and skewed slightly to give the illusion of a floating mirror, suspended just behind the central sphere to the right. Added dimension was achieved by allowing the mirror to overlap the edge of the background slightly. The glass-like rod in the lower center under the sphere was created by vertically compressing a copy of the mirror patch, then rotating it slightly to the left and capping it with a smaller piece of the background. The larger reflective sphere in the lower left foreground was created by carefully arranging warped patch copies of the rest of the composition, giving the illusion of true reflections of the near background and surrounding environment. It was then faded out to the left margin, extending over the left edge of the background, creating the impression of an emerging body from the outer spaces of the blackness that surrounds the entire composition. This gave the appearance of it moving into the arrangement of the other elements, as if to take its place in the suspended environment of the central sphere, rod and mirror. This image won an award in an international graphics competition and has enjoyed some notoriety.